The Birla science museum lacks a properly organized administration area. The offices are situated on the second floor near the exhibition galleries. It causes disturbance to the employees. Birla Science Museum has a visiting crowd of 2000 people on weekdays and 5000 people on weekends and other holidays. On an average, 90% of the visitors are students and most of the visitors are non-locals who come to the museum as a tourist destination. Thus the parking area should have facilities for school buses and tourist buses. Ample 4-wheeler and 2- wheeler parking should also be provided. Museum timings: 11 a.m. – 7 p.m.
Additional Parking facilities should include parking for staff and VIPs. The Birla Science museum provides parking for 6 buses, 30 cars and 200 two wheelers which is insufficient for the visitors. 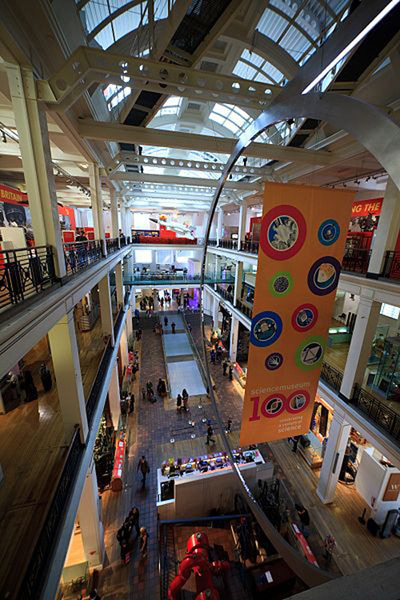 The science museum has 2 staircases and 1 fire exit. It has a 4’ x 4’ elevator for handicapped persons and no escalators. As per norms, every building should have a staircase at a distance of every 75’-0”. In addition to the normal staircases and lifts, it should have at least one additional fire escape lift and staircase conforming to the NBC norms. Ample number of lifts should be provided for all the visitors and a special service life should be provided for carrying the museum exhibits to the upper floors. Storage rooms in a museum are high security areas that are accessible to only a few staff members. The Birla Science museum has strong rooms on every floor made of concrete with special Godrej doors. Storage spaces in a museum are used for storing exhibits that are not on display all year round, for repairing damaged exhibits and storing exhibits temporarily before putting on display. The Birla Science museum has two water tanks each of 70,000 litres capacity. The overhead tank has a capacity of 10,000 litres. Water supply is different for drinking and gardening purposes. The museum used to have a septic tank but currently the septic tank is not in use and the waste water is directly empties into the main sewer pipeline. Security in a science museum is not of great importance as most of the exhibits are only models or photographic displays. However since it is a place of public importance thus basic security systems such as intruder alarms, surveillance cameras and other anti theft devices need to be provided. Air conditioning may be provided in a museum if desired. However natural ventilation is the best option since security is not an issue. Avoiding air conditioning will provide environmental benefits. However the museum may need to have certain air conditioned zones where exact temperatures need to be maintained for exhibits. The Birla science museum has air conditioning only in the doll house where an exact temperature of 300C needs to be maintained for the ivory dolls. This entry was posted by Benzu JK on July 7, 2013, 6:12 am and is filed under Design Guide. You can follow any responses to this entry through RSS 2.0.